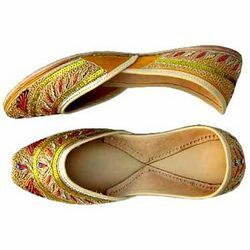 We are engaged in exporting and supplying a wide assortment of Designer Juttis. 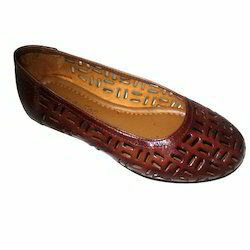 Best for casual or occasion purpose, these juttis are provided in numerous sizes, colors, & style. Offered juttis are manufactured by employing superior quality basic material & sole in sync with set market standards. We have carved out a position in exporting and supplying the best quality Fancy Modern Jutti. The offered shoes are manufactured at vendor’s production unit, under the direction of vendor’s skilled professionals. Our shoes are checked by vendor’s quality controllers on various parameters. Also, the shoes offered by us are provided at affordable prices to our valuable clients. 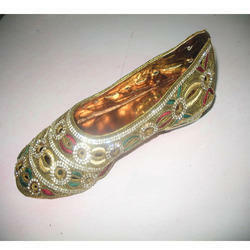 We are offering wide range of Designer Juttis for Culturlal events. These are made of superior raw materials which are comfortable to wear, advanced in variety, sustainable, attractive in design and are high in demand. These standard sized sandals are widely supplied at the nominal market price range. Looking for Fancy Jutti ?